Hard quite to know what should be classified as a spoiler for this film. I've tried not to give too much away, but it's hard to discuss it without giving something away somewhere. A phrase that's been repeated again and again as critics seek to make sense of Darren Aronofsky's mother! (2017) is for the need for more time to process things. It's a deeply unsettling film where the intense imagery is unceasing. Those are words that describe the emotional experience of watching it as opposed to a philosophical assessment based on it's use of biblical, and indeed numerous other, archetypes, because it's a film that perhaps above all else is designed to make its audience feel. Almost every shot is taken with in the confines of the tumbledown house that Jennifer Lawrence's titular 'mother' and her partner are seeking to repair. Of it's two hour running time, 66 minutes of it are on on Lawrence's face (Kermode and Mayo, 2017) and almost all of the remaining shots in the film are taken from her point of view. It's a performance that's gained wide praise from critics. Aronofsky himself has said that despite having "watched it hundreds of times, I'm always seeing little things that she's doing that I'm just like wow! I've never seen that before" (Kermode and Mayo, 2017). There's an intensity to the film, which combined with the whirling camera and the claustrophobic atmosphere make for extremely uncomfortable viewing. What's interesting about mother! (small 'm', absolutely significant) is the way that on the one hand it presents the kind of film that feels unique and original (it's failure to conform to any one particular genre is doubtless part of the reason why many have dismissed it), whilst simultaneously being packed full of references and tributes to both other films and other stories. The archetypal references abound with resonances of God, Mother Earth, Adam and Eve, Cain and Abel, Mary, "The Odyssey"'s Penelope and humanity itself rubbing shoulders with a more gnostic and eastern style philosophy. At the same time it evokes such diverse films as The Amityville Horror, 2001: A Space Odyssey, Rosemary's Baby, zombie movies and the work of Lars von Trier. Many have cited Buñuel's Exterminating Angel, but I see plenty of Viridana in it as well. Yet at the same time as the cosmic elements of allegory and parable, it's also a story about two individuals, and our differing attitudes to our private spaces. It may be an Englishman's home that is supposed to be his castle, but this attitude clearly crosses gender and continental divides. Ultimately, such readings are only those that occur to me. What is great about Aronofsky bizarre and ambiguous work is that it will speak differently to different people. The downside is that so many are horrified by it they don't like what they see. The earliest known occurrence of the story of Daniel in the Lions' Den being adapted for film goes back to Pathé's Daniel dans la fosse aux lions (dir: Lucien Nonguet, 1905). Released within a decade of the invention of cinema it is one of the earliest examples of the spectacular in biblical films, which had been hitherto dominated by passion plays. 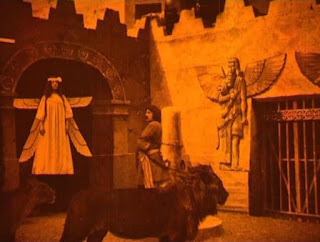 Not only did the film make use of, the by then increasingly common, double exposure to portray angelic appearances, it also featured people trapped in enclosed spaces with real-life lions. 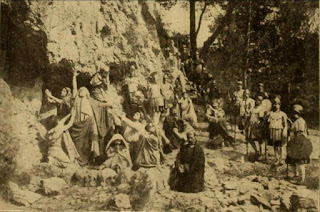 The success of this film resulted in a flurry of films about Daniel in the early silent era though only Gaumont's Daniel dans la fosse aux lions (dir: Louis Feuillade, 1908) and Vitagraph's 1913 film Daniel (dir: Frederick A. Thomson / Madison C. Peters) seem to have covered this particular story. Surprisingly, from this point on filmmakers appear to have lost interest in the lions' den narrative. It was not until forty years after the Vitagraph film that the story would be brought again to the screen in Columbia's Slaves of Babylon (dir: William Castle, 1953). Even then the film is clearly cheaply made (particularly for a major studio) and Daniel is supplanted as the main character by the fictional Nahum. The brief lions' den scene occurs about halfway through the film and is set during the reign of Nebuchnezzar rather than Cyrus. This is because the film has made Cyrus one of its heroes who is mentored by Nahum and thus rises from a shepherd boy to king. The scene itself sees Daniel, who is wearing a large Star of David pendant, being abused by an angry crowd who jeer and throw stones at him en route to the den. Despite the fact that the story has not been adapted a great deal as a standalone film, it has proved to be of more interest for those making a series of films, particularly for television. Daniel featured twice in The Greatest Heroes of the Bible series in 1978-79, including a whole episode being devoted to the story in Daniel in the Lions' Den (dir: James L Conway, 1978). As is typical of the series, it's a tame affair, with an invented sub-plot that makes Daniel appear incompetent, and a very poor special effect used to portray the divine presence that keeps the eponymous hero safe. Another extended series to include the episode was the Welsh/Rusian collaboration Testament. The Bible in Animation. The Daniel instalment, directed by Lioudmila Koshkina in 1996, utilises a a story within a story plot structure, told centuries after the events have taken place. It uses an unusual animation style of oil paint on glass form of animation, which gives a rather gruesome appearance to some of the less child friendly moments in the story. The non-realistic animation makes these shots more permissible, yet paradoxically more disturbing at the same time and are particularly effective as the pack of hungry lions tears towards Daniel as the den is sealed. Whilst the story of lions' den has not proved popular in the wider culture, recent years have seen far greater interest in animated productions of the story often aimed primarily at a Christian audience. These include Animated Stories from the Bible: Daniel (dir: Richard Rich, 1993), The Beginners Bible: The Story of Daniel in Lions' Den (dir: Gary Selvaggio, 1996), Greatest Heroes and Legends of the Bible: Daniel and the Lions' Den (dir: William R. Kowalchuk, 1998), Veggie Tales: Where is God when I'm S-S-Scared? (dirs: Phil Vischer/Mike Nawrocki, 2003) and Bugtime Adventures: It's the Pits (Jeff Holder, 2006). All five of these productions originate in America suggesting that the story of Daniel in the lions' den is in an unusual situation. One the one hand it appears to be of little interest to wider audiences, but on the other it seems to be of particular interest to the Christian community. Whilst the above titles could be merely suggesting popularity with children, there have also been two recent live action versions of the story the Liken Bible Series' Daniel and the Lions (dir: Dennis Agle Jr., 2006), a product of the Church of the Latter Day Saints; and The Book of Daniel (Anna Zielinski, 2013) by the American evangelical studio PureFlix. The latter film spends the longest amount of time developing the relationship between Daniel and Dairius. It's also the only films to show lionesses joining their male counterparts. Daniel cites the words from Lamentations 3:55-58 as well as various fragments from the Psalms. The recent popularity of the story with American evangelicals suggests that this is a story they feel is particularly important them. Given the rhetoric in recent decades about traditional Christian values being under attack it's not hard to see how the Daniel story resonates with this. Daniel (and his friends) represent a beleaguered minority who are under attack from a hostile wider culture, but who, by holding true to their values, ultimately prevail. There's a double persecution metaphor here. Not only do they find the cultures of the Babylonians / Medes / Persians hostile but there is also the more raw and immediate threat of the lions. Of course it is precisely for this reason that the phrase "the lions' den" has entered into the wider lexicon as a metaphor for entering a hostile situation. This metaphorical use accounts for the title of Argentinian director Pablo Trapero's Leonera (Lion's Den, 2008) which tells the story of a pregnant woman's incarceration in a state prison (pictured above). Whilst the references to the biblical text are largely limited to the film's title, the sense of fear, hostility, danger, oppression but ultimately survival resonate with the danielic theme. The lions' den incident also comprised a significant part of the fifth episode of The Bible (2013) which manages to cover a significant proportion of the Book of Daniel. The lions' den scene portrays a genuinely terrified Daniel who is, rather oddly, clad only in a loincloth. Whilst the series was both produced by American evangelicals and with an eye very much on that demographic, it also sought to appeal to a wider audience, perhaps an indication that the story is finally finding a hearing in the wider culture, and redressing an under representation that has been in effect since the end of the early silent era. As I mentioned on Sunday, last week in Leicester was the British Silent Film Festival which this year had a specific focus on the transition from silents to sound. One of the films screened, as part of the Edgar Allan Poe evening, was The Fall of the House of Usher (1928) directed by James Sibley Watson and Melville Webber. 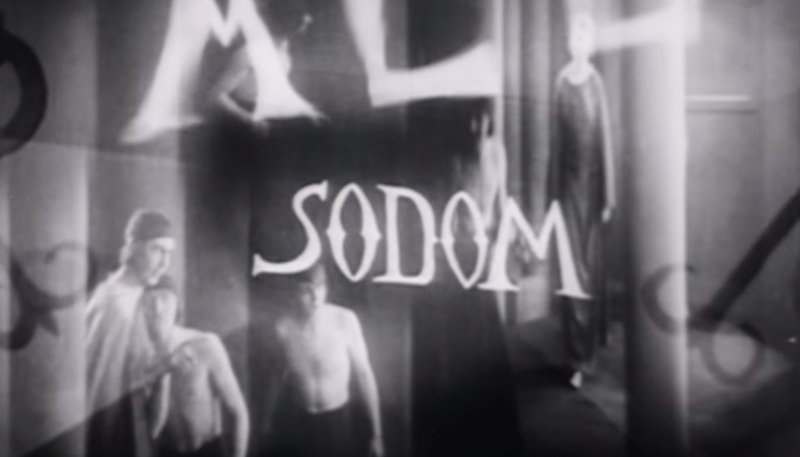 As it is, for some time I've been meaning to write up Watson and Webber's later work Lot in Sodom (1933), so it was useful to see their other film for comparison. Relatively little material remains about the life and work of James Sibley Watson and Melville Webber, indeed Webber hasn't even been granted a Wikipedia page. Both men's film careers were short. Aside from these two films together, they also made Tomatoes Another Day (1930) and collaborated on three minor industrial films, but apart they each only made one other film of note, Webber's Rhythm in Light (1935) and Watson's Highlights and Shadows (1938). This is enough, however, to count as a significant contribution to the avant garde / early experimental movement of the late twenties and early thirties. Indeed, the film "ran for more than two months in New York, and continued to play in theatres throughout the 1930s and 1940s, becoming in the process probably the most commercially successful avant-garde film of the era" (Horak, 2008: 41). On top of this it's clear to see - with the benefit of hindsight of course - that, for Lot at least they were pioneers in queer cinema in an age when homosexuality was still illegal. Lot's influence on later queer cinema such as Derek Jarman's The Garden (1990), is plain to see. As with Usher it's difficult to follow what's going in without prior knowledge of the story, not least because five years after the introduction of talking pictures, Lot in Sodom is still essentially a silent film, available then with atonal music by Louis Siegel and available today with the additional option of an excellent modern soundtrack by Hands of Ruin. Both films show a marked similarity of style such as expressionistic sets, superimposed shots, strange camera angles, floating text, kaleidoscopic images and various other experimental techniques. Cuts are often abrubt, and often the connection between the two shots is not immediately obvious. In places the editing is reminiscent of Vertov's Man with a Movie Camera (1929), much of the sets feel like Murnau's Das Cabinet des Dr. Caligari (1920). One popular technique is superimposing the same symbolic image onto a shot several times, such as the hammer with which Roderick seals his sister's tomb in Usher arrays of naked torsos here. Watson and Webber's film is a loving tribute to two things- an admiration for the human, and predominantly male, form; and a treatise on the formal potential of cinema. The first is hardly revolutionary. the human body has held a fascination for artists since almost as long as art itself. Watson and Webber seemingly took the approach best embodied by Cecil B. DeMille, that of basing a film on a moralistic/biblical story in order to reduce objections to the amount of flesh on display. However, whilst Lot in Sodom ultimately ends with the fiery destruction of it's inhabitants, clearly the filmmakers are rooting for the losing team. That impression is underpinned by numerous factors. It's telling, for example that the film is almost halfway through before the angel of the Lord arrives to set the plot in motion. Then there is the contrast between Lot and the Sodomoites, both in terms of looks and of how they are shot. The sodomites are all youthful, dynamic and attractive. In contrast Lot looks like a cross between an Assyrian Bas Relief and an anti-Semitic stereotype. He is comparatively old and unattractive, heavily clothed in contrast to his townspeople and the camera spends far less time lingering on him than it does on his neighbours. Furthermore, as Alina Dunbar points out "in contrast to the Angels and the Sodomites, who are nearly always featured in either medium or full-shots, Lot is frequently cast on either the right or the left side of the frame, in such as way as to suggest that he does not have the power to fill the screen by himself." 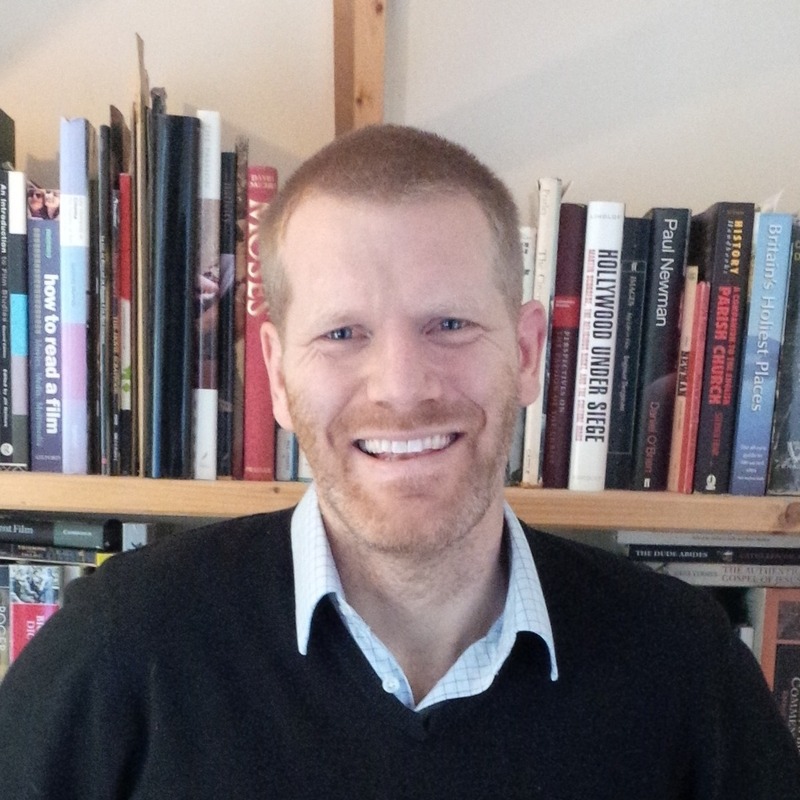 (Dunbar, 2014). On top of this, there is also the way that Lot himself seems somewhat conflicted. At one point the film cuts from a shot of Lot in the dark to an intertitle that reads “How long shall I take counsel in my soul, having sorrow in my heart?”, yet, as Grossman observes Lot "never moves his mouth, in defiance of silent film conventions...the film “speaks” through an intertitle while the character remains totally silent, splitting in a surprising way the cinematic soul" (Grossman, 2014). As events come to a head, Lot raises his hands to God in desperation, only for the terrifying answer "withhold not even thy daughter"to come back not as an intertitle, but superimposed over the image. An array of Latin phrases follow in similar fashion, as if floating on the screen their meaning unclear: Non Tacta (untouched), Mulier (woman), Templum Est (the temple). Given the most famous element of the story from Genesis, it is no surprise to find that this sense of internal conflict also extends to Lot's wife. Eventually the angel (singular) steps in save the day, rays of light shine from his chest and Lot and his wife and daughter escape, but of course Lot's wife turns to look back and is turned into a pillar of salt. Harries makes the case at length that her retrospection here is the result of her "evident curiosity about, and perhaps even sympathy for, this city; it portrays her backward look as punishment for this sympathy" (Harries, 2007: 45). As she undergoes her metamorphosis images including tormented people and the city's temple are superimposed over her as if to emphasise the point that it is her sympathy for the city that is causing her to change, or perhaps causing her to be punished. As an image it's provocative, challenging and one that only unveils the fullness of its meaning on multiple viewings, so typical of the film itself. Fischer, Lucy (1987) "The Films of James Sibley Watson, Jr., and Melville Webber: A Reconsideration" in Millennium Film Journal, Fall/Winter 1987/1988, Issue 19, p.40 - this is available here, but I've not been able to gain access. Moore, Marianne (1933) "Lot in Sodom" in Close Up, September 10, 1933, p.318 - archived here. Moore worked with Watson and later wrote about the making of the film. It's been the British Silent Film Festival this week, hosted in my local city of Leicester, so whilst none of the films are (strictly) biblical, it nevertheless seems like an apt occasion to look at some more Silent Bible Films. Daniel dans la fosse aux lions is part of Les martyrs chrétiens (dir: Lucien Nonguet, 1905), but it's one of those occasions where it's difficult to know whether one film is being discussed, or three. It seems to have been a tactic favoured for a few years around 1910 (see also the discussion on Gaumont's 1910 Esther and Milano's 1910 San Paolo one). The first film in the sequence consists of a lion tamer performing some stunts in the Roman arena, before a cut and we are treated to a procession round the arena featuring two Christians. They bow before the emperor before being strung up on crosses, which largely obscure their bodies from view. In a gruesome finale the lions then tear meat from the crosses moments after a cut has, presumably, switched the bodies. This then is the context into which Daniel dans la fosse aux lions is presented - the earliest known adaptation of the story of Daniel in the lions' den being adapted for film. It consists of what appears to be only one shot, although it is at least two, and possibly several more (of course all "shots" in cinema are actually just a series of individual still images displayed consecutively). At the start of the film Daniel is lead out and tied to a post, whilst Darius looks down from the very top of the shot, gesturing in Daniel's general direction. Then the gate opens and a lion and lioness enter, the lioness even coming close enough to sniff him. Given the scene that has just been witnessed this would, presumably have been a tense moment for many in the audience. In the opening film the switch is fairly obvious, but here 'Daniel' is clearly real living flesh and blood. Sadly, the tension is then rather wasted by an angel materialising in front of us via via a not particularly impressive double exposure. As the angel disappears, Daniel's chains fall off much to the relief of the still watching Darius. Pausing to give the lions a little stroke he leaves the den via the gates from which he entered. It remains the most daring Daniel in the Lions' Den sequence on film. Double exposure was a popular photography trick even before the invention of the movies, so it's no surprise that it was such a popular technique so early in the development of cinema. Conversely, the sight of a man seemingly at the mercy of lions would be a cheaper way for audiences to experience the thrills of lion tamer-type circus skills. Combining both together in this way, probably represents the earliest example of 'the spectacular' in biblical films, which has remained popular in biblical epics through to today. The final film in the sequence is Le festin de Balthazar (Belshazzar's Feast) which I wrote about back in 2014. Episode 5 of The Bible (Survival) picks up one of the parts of the book that most adaptations tend to miss, so packed into this episode is both a bit on Jeremiah and a good deal of the Book of Daniel. This is definitely one of the episodes in this series that keeps on track to covering the biblical material without getting waylaid in invented subplots. Jeremiah is played by Raad Rawi and appears old and shaggy looking, (in keeping with Jeremiah's likely age at this point). Certainly he's nowhere near as hot as Patrick Dempsey, from the 1998 film version, though that film focused far more on the start of Jeremiah's ministry. The contrast is all the greater, then, with the actor playing Daniel. I must admit that when I've read Daniel in the past, it never occurred to me that he might have a six-pack. I suppose I should probably blame the lack of a major-studio produced 50s biblical epic adaptation for that. The Daniel section of the film not only includes the Lion's Den scene but also has time to show Daniel's rise to prominence via dream interpretation; Shadrach, Meshach and Abednego surviving the Nebuchanezzar's furnace (thanks to a suspiciously Jesusy-looking angel); and Nebuchadnezzar descent into madness. Guinness isn't quite munching-grass in these scenes, but that's probably because he's already had his fill of the scenery. It's not really made clear why on top of being fed to the lions Daniel also has to undergo this trial in just a loincloth, aside from the opportunity to show off the prophet's abs. In any case what the film does do well is to show show a genuinely fearful Daniel, even if we know it will all be okay in the end. I suppose Daniel's near nakedness heightens the sense of his vulnerability. And then the Israelites get to go back to Jerusalem and there's still 7 minutes left to talk about the Romans ahead of the next episode. 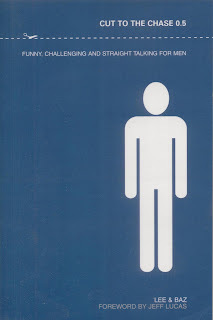 All in all this is one of the better entries in the series, not only covering a lot of material without getting sidetracked, but by providing one or two genuinely insightful moments. The Companion has three parts. First, 'context', focusing on the 'Bible in' specific film genres and cultural situations. Second, 'theory', with a focus on film theory or methodologies and how these can overlap with biblical and theoretical methodologies. Third, 'recent and significant texts', with a focus on which texts and themes have been most important in 'biblical film' and which are currently at the fore. The volume is unique in paying close attention to film genres, and film theory. Each section of the book begins with an extended introductory essay to provide a full overview of the themes discussed and introduced. Another key feature is the inclusion of non-Hollywood films, and films that do not at first glance appear to be 'biblical'. My own chapter comes at the start of the book's third section, "Texts" and is called "Can We Try that Again? 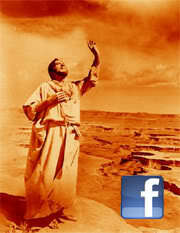 The Fate of the Biblical Canon on Film". There are more details including a full list of titles and authors available from the T&T website, but the names of some of the other authors will be very familiar to those who like to read on this topic. In addition to Richard Walsh, Adele Reinhartz, Jon Solomon, Lloyd Baugh, Rhonda Burnette-Bletsch and David Shepherd have all contributed. Having enjoyed some of James Crossley's work in other areas of biblical studies, I'm also looking forward to his perspective. Release is looking like being in April/May next year. There's a common tendency in western thinking to try and find a rational explanation for some of the miracles that we find in the Bible, as if a timely arrival of plagues of locusts here and a psychosomatic condition there, solves everything. One of such theory has grown up around the three hours of darkness said to accompany with Jesus' crucifixion, namely that it could have perhaps occurred at the same time as an eclipse. The link between Jesus' death and Passover (which is determined by a full moon) and the absence of a spring-time eclipse in the possible years of Jesus' death make this unlikely, yet it's nevertheless an interesting theory, and, after the solar eclipse in North America two weeks ago, I thought it was about time I reviewed this one. The decision to shoot during the eclipse was made just 48 hours beforehand, and doing so was uncharted territory. The film's director of photography, Aldo Tonti, working in the dark (both metaphorically and literally) moved the camera so that the Sun shone directly into the centre of the lens, and in the end resorted to taking off any filters, fully opening the lens, and hoping it would all work out. Even if not historically accurate, the results are spectacular, comprising one of the earliest film recordings of an eclipse and giving the scene an eerie feel that is far superior to the equivalent scenes in the other biblical epics of the era. Having witnessed the eclipse that crossed the UK in 1999 I can recall the strangeness of the moment which Tonti's work captures so brilliantly. The impact of this eerie moment is heightened by Mario Nascimbene's haunting score and by the off-hand way in which the film has treated Jesus up to this moment. Whilst movie audiences were used to films in which Jesus was only a minor character, the lead up to this scene had largely stripped him of any significance. His first appearance in the film is when the camera begrudgingly nudges left to incorporate him around the fringes of the opening shot of Pontius Pilate. The shot begins shooting up a set of steps towards Pilate, emphasising his power: Jesus' almost incidental incorporation in its far reaches emphasises his weakness. The shot also positions the viewer as if they are in the crowd (which is routing for Barabbas), thus enabling the audience to associate with him, whilst also making them complicit in his death. Jesus' entrance is made all the more derisory when contrasted with the first shot of the film's anti-hero Barabbas moments later the sole figure sitting up directly into the only beam of light entering his cell. In one sense Jesus' and Barabbas's paths have separated at this point. Barabbas is free; Jesus is condemned. Yet Barabbas cannot get away from the "prophet". He arrives back amongst his friends only to find his girlfriend has become one of his followers. As he tries to laugh off his experiences, Jesus passes by his window en route to Golgotha. When he tries to sleep things off he awakes in an eclipse fearing the light he saw before and the darkness that now envelops him. Quinn's Barabbas is clueless as to what is really happening. Seven years after La Strada Quinn channels much of Zampano here. Barabbas too is a brute whose world is in turmoil after encountering a person whose sheer goodness leaves him dumbfounded. Like the eclipse itself, the light is there and yet somehow Barabbas left fumbling in the darkness, his encounter with Jesus haunting him rather than freeing him. The film, already the second adaptation of Pär Lagerkvist's 1950 novel following Alf Söjberg's 1953 adaptation, makes several changes to the text. The "hare-lipped" woman of the novel, who befriends Barabbas, witnesses the empty tomb and then becomes Christianity's first martyr, is here transformed into Rachel, Barabbas's girlfriend. Her death so enrages Barabbas that he goes on the rampage, gets recaptured by the authorities and is sent to the sulphur mines. 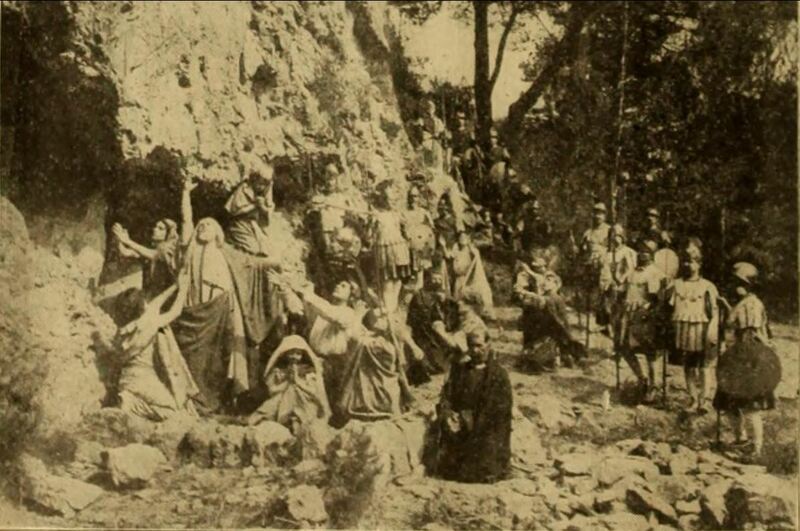 The scenes in the sulphur mines are unusual for a biblical epic. Barabbas is held there for twenty years, the passing of time skilfully laid out through a long montage marking his gradual descent deeper and deeper under the earth until he reaches its bottom level. Eventually he is chained to Sahak, who eventually reveals that he is a Christian. The two fight, and then bicker over Barabbas's name as it emerges that, even after twenty years, it still stirs up hatred in both of them. Barabbas is clearly still disturbed by his brief encounter with Jesus. For Sahak the way in which Barabbas is still haunted by his past is evidence of Jesus' significance. "What other man's death could have troubled you so long? Eventually Barabbas agrees to Sahak scratching a cross on his slave tag, not because he believes, but crucially because he "want(ed) to believe". Having somehow escaped a catastrophic collapse of the sulphur mines, Barabbas is taken to the Coliseum to fight as a gladiator, in the film's biggest diversion from the novel. Despite his age and the two decades he has spent slaving in the sulphur mines Barabbas seems impervious to his opponents defeating. Even the sadistic defending champion Torvald, played by a hammy Jack Palance is beaten in a somewhat lucky encounter. Not only is the observation is made five times in the script that Jesus died instead of/in place of Barabbas,3 but there is mounting evidence that Barabbas cannot be killed, as if sentenced to wander the earth unable to make peace with himself. The film ends, however, on a more ambiguous note. Barabbas finally is crucified, but it is unclear whether his dying words "Darkness. I give myself up into your keeping." are an affirmation of faith or a denial of it. Of all the biblical epics this is the one that leaves itself most open to an existentialist interpretation. The story was remade in 2012 with Billy Zane in the lead role. 2 - Meyer, Stephen C. (2015) Epic Sound: Music in Postwar Hollywood Biblical Films, Indianapolis: Indiana University Press. p.198. 3 - Kreitzer, Larry J. (1993) The New Testament in Fiction and Film: On Reversing the Hermeneutical Flow, Melksham, Wilts. Sheffield University Press. p.85. 4 - Meyer (2015), p.208. So here's an insightful critical opinion: Left Behind isn't terribly good. However, given it's imminent, um, disappearance from Netflix next week (at least in the UK), I realised that whilst I didn't really want to see it. I probably should have. That feeling stems, in part, from its curious basis in scripture. For many years the theology behind the "Left Behind" series of novels and subsequent movie adaptations seemed poor. It didn't feel like the same kind of film as one dramatising a story from the Old Testament. But somewhere over the years as my views on the historicity of the Bible has changed and my definition of what I tend to do here (cover dramatic adaptations of the biblical narratives) has crystallised, I've begun to have a nagging doubt that perhaps films such as Left Behind should be something I cover. So here I am. And whilst this won't be my mot scholarly or thoroughly written pieces, one of the advantages of having a blog is that sometimes you can just bang out a few thoughts on something without it really mattering. Of course it would be easy to turn this into a slate-a-thon, but, that tends not to be the way I do things. And actually there are a few moments in this film that are worthy of comment. The first is the moment when the rapture actually happens. The actual moment itself starts not with something bombastic, but simply with a child disappearing from the middle of a hug. Things get pretty ridiculous and turn to action movie hyperbole pretty swiftly with disappearing pilots and bus drivers whose vehicles somehow career along the road for minutes and minutes after the person pressing the accelerator has long since vapourised, but that initial moment is actually fairly well done. Firstly, it's subtle, which allows the focus to be on just one person's emotional reaction. Secondly it's kind of mysterious and takes a split second to soak in, even in a film where you now it's going to happen. Furthermore, rather than relying on expensive special effects it's simply executed, meaning you don't feel the need to figure it out immediately afterwards. There's also one good jumpy moment as our heroine investigates the now entirely absent maternity ward. It's unclear to me why all the children disappear, apparently turning back the clock on the concept of original sin and suggesting some kind of coming of age when suddenly you become leave-behindable. It's also unclear where all the staff and parents have gone, though I suspect this is more due to drama than theology, but there's a sudden noise on the soundtrack and a jump cut to a mother and suddenly you realise that you're a bit more caught in the moment than you realised. (I'm slightly red-faced in having to admit this). The film is rather different from the original novel. For one thing it's significantly shorter, turning the story into a disaster movie that focuses on a relatively small-but-positive story and it's pay-off in the face of all those other stories which all ended so badly. This is far from unique. It's very much in the mould of films such as Independence Day and The Day After Tomorrow in this respect. It wears it's America-centrism very much on its sleeve. I'm not a huge fan of either of those films, but Left Behind seems poorly paced compared to those efforts. The Rapture happens too far through the film, but not late enough to have given any real heft to the father/daughter relationship at its heart. That said it lacks the hubris and self-congratulatory nature of those other films, perhaps because the potential trauma of a crash landing never seems real, and the disappearance of (surprisingly few) passengers seems somehow more real than those who die when Independence Day's flying saucer wreaks havoc. Presumably the fact that the film makes so little progress through the novel means that the filmmakers lack any serious ambition to film the entire series. This is a wise move. Even if the matched the Harry Potter model of one-ish film per book, it seems unlikely that there will be enough of an audience to sustain sixteen such novels. What the makers of this adaptation of Left Behind have done is strip the novel back to that which has the widest appeal, and fashion a film that doesn't sit too uneasily alongside a lot of the mainstream fare in cinemas. I must admit that rather took me unexpectedly.